Take a Look by Dinda Puspitasari: #88LOVELIFE: You Are Invited! I have a good news about @88lovelife! 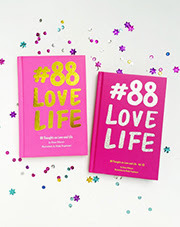 This Saturday, November 1st, me and the awesome author of #88lovelife, Diana Rikasari will be at the meet and greet where you can purchase my #88lovelife book and have it specially signed by us! Here, you will also be able to buy our special edition #88lovelife merchandises and take pictures (ehm.. selfies) with us because BEST PHOTO will win the whole set of our #88lovelife merchandises! See you youuuu!